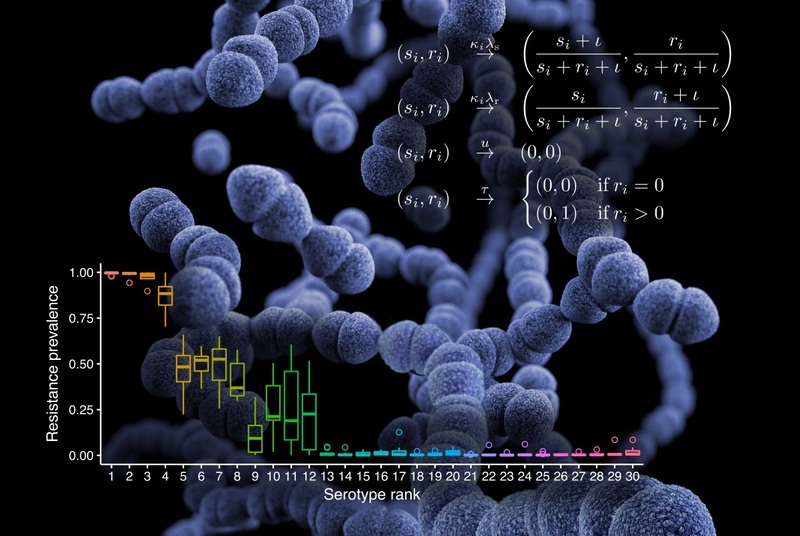 How can mathematical modelling help us to understand the evolution of antibiotic resistance? Unchecked, the spread of antibiotic resistance has the potential to fundamentally hamper our ability to treat bacterial infections. In spite of this potential threat, we have a limited theoretical understanding of what drives the evolution of resistance in pathogenic bacteria. This may seem surprising to anyone who is familiar with principles of ecology and evolution. We know that antibiotic use selects for mutations conferring resistance in bacteria. In many cases, resistance genes have been identified and sequenced, and their phenotypic effects have been measured: such mutations generally confer a fitness benefit in the presence of antibiotics, but also incur a fitness cost in the absence of antibiotics. The rest should be simple population genetics. And yet, things do not seem quite so simple. Observation shows that resistant and non-resistant strains of the same bacteria are able to circulate in the same populations over an extended period of time without either strain competitively excluding the other. If resistance offers an advantage overall, why doesn’t it sweep to fixation as simple models suggest it should? To paraphrase a foundational paper by Caroline Colijn and colleagues, what explains the persistent coexistence of drug-susceptible and drug-resistant strains of pathogenic bacteria? It is crucial to identify what is missing from simple models of resistance evolution, because without an understanding of what forces drive resistance evolution in natural microbial populations, we risk being unable to explain patterns of resistance. In turn, this means that we may struggle to make evidence-based predictions for resistance evolution or to evaluate potential interventions—antibiotic stewardship, new drugs, vaccines, infection control—that have been proposed to manage this threat. Our new study in Nature Ecology & Evolution explores the impact of within-host competition between sensitive and resistant strains on the evolution of antibiotic resistance. We suggest that within-host competition creates frequency-dependent selection for resistance, and that this has the potential to explain much of the widespread coexistence between sensitive and resistant strains that we observe. Crucially, we evaluate our hypothesis by fitting our model to data describing resistance prevalence and antibiotic consumption from 30 European countries. Testing our model against data is important, because it may be a step towards developing the predictive models of resistance evolution that we need. Like many others, I think of antibiotic resistance as presenting a similar problem to that of climate change. In both cases, the widespread use of a technology that has been tremendously useful to individuals is causing cataclysmic effects that will be felt by everyone. Yet while projections for climate change are supported by complex mathematical models run on supercomputers, we lack a similarly robust understanding of how antibiotic resistance will develop. As a consequence, there is considerable uncertainty over how much of a threat resistance poses in the next few decades. For example, a widely-cited report suggests that resistant infections have the potential to be deadlier than climate change—but the certainty of this prediction has been called into question by others. I hope that our new paper will help encourage the development of more comprehensive models that take in more data—from a larger geographical area, for example. (Our focus on European countries is a limitation, but one that is partly driven by the high quality of the data collected by the European Centre for Disease Prevention and Control.) A consensus on the trajectory of resistance evolution will help to focus policymakers on effective strategies and mobilise resources where they are needed.